Welcome back to the continuing story of what I did on the Saturday long weekend! After my excursion to the City Market, I popped home briefly to drop off my farmers’s market goodies. Next up, the annual Edmonton Heritage Festival! This is my favourite Edmonton festival. 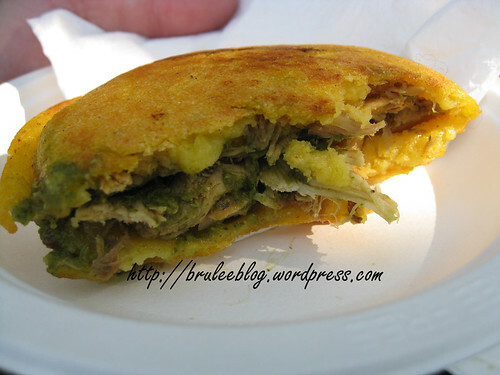 The food, the sights, the culture, Hawrelak Park, the weather – they all combine to make a perfect day. I admit I have a soft spot for this festival; I was a frequent volunteer back when I was a student. I spent many years handing out maps at the information booth, and even spent some time drawing awkward cartoons on kids’ faces (“But I don’t know how to draw,” I cried. “That’s okay,” they said as they handed me a box of face paints.). One year I had a really fun job where I got to wander around the whole park and ask people to fill out a short survey about the festival. It was the best volunteer job I’ve ever had so far, probably because I wasn’t stuck in a tiny booth or in one spot for my whole shift. After lathering on DEET (to fend off the mosquitoes that have invaded the city) and sunscreen, and carrying a bag of canned food for the Edmonton’s Food Bank, I headed off to Hawrelak Park. I was happy to see quite a lot of people in attendance; from my past experience Saturdays generally aren’t as busy as Sundays and Mondays, and I wondered if there would be a lot of competition due to all the other events happening in the city at the same time. Finding the Food Bank donation box was easy enough because they were everywhere near the bus drop-off, but finding a map or information booth proved to be nearly impossible. Who’s bright idea was it to stick them in white tents with only one tiny sign on the front of the booth? And why were they all open to the middle of the park instead of facing the pavilions? 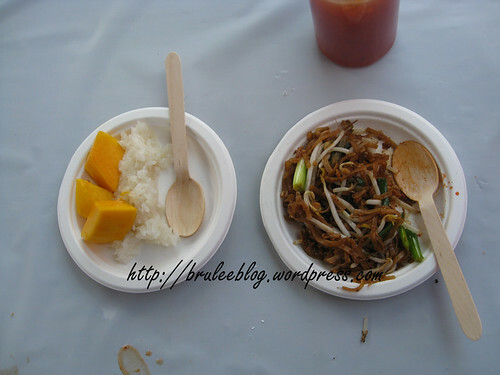 All the pavilions were using bamboo or recycled plastic cutlery, and what looked like to be recycled plates and bowls. There were a lot of recycling bins around too, but it looked like people were confused as to whether or not they could recycle their cutlery and plates once they were finished with them. My first stop was at the Thailand pavilion for some pad thai and sweet sticky rice and mango goodness. 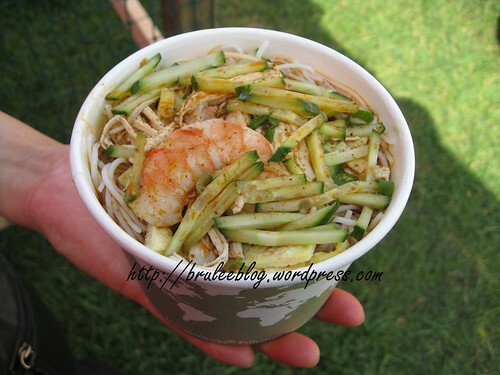 And then the Boreno tent tempted me by offering laksa on their menu. It was ok but ultimately disappointing to someone who has eaten really good laksa before – the soup wasn’t coconutty enough, the shrimp was deceptive because it was only half of a piece, and there was barely any hot spicing to the soup. 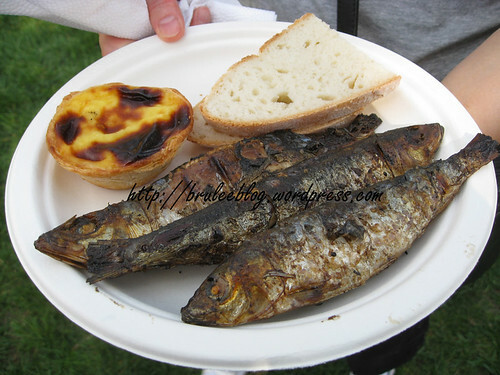 A stop at Portugal netted me BBQ sardines and a pastel de nata. The pastel de nata was creamy and a little less sweet than the Chinese version that I’m used to, which I liked. The sardines were big ones, unlike the dinky ones that I’m used to finding in cans, and were a great value for the ticket price. They were delicious and a maybe a tad too salty, but I was a little bit disappointed that they weren’t gutted at all. The bones of the smallest fish were easy to crunch into, but the larger ones had to have the flesh picked off of them. I admit I did eat the heads. And they were yummy. Don’t knock fish heads until you’ve tried them! 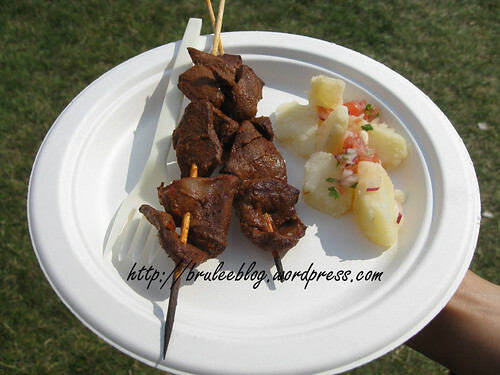 I actually had a passing stranger stare at me and emit nervous giggles as I ate Peru’s offering of anticuchos (beef heart marinated in vinegar, oil, cumin). Tender and flavourful, this dish was one of the highlights of the day. 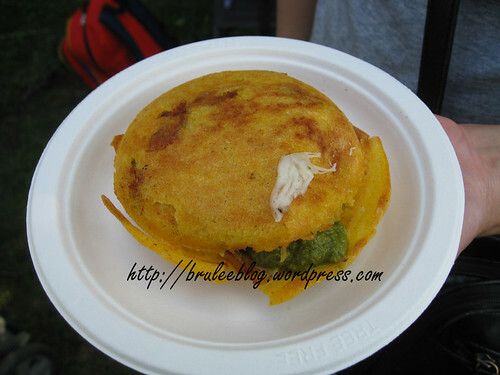 The arepas over at Venezuela had a wonderfully crisp cornmeal outside and delicious inside chicken and guasacaca sauce. We should have gotten two of them, but I was starting to get quite full by this point. Being almost full didn’t stop me from ordering more food, however. 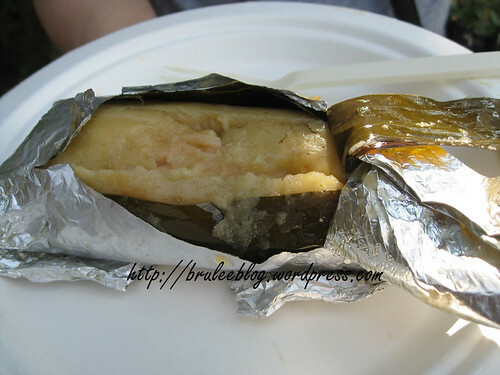 I noticed that the El Salvador pavilion was selling tamales. These were supposed to be stuffed with chicken, olives and potatoes. While there were some chunks of chicken in it, I couldn’t taste any olives or potatoes. In fact, this tamale was disappointingly bland and even a liberal addition of hot sauce didn’t help much. 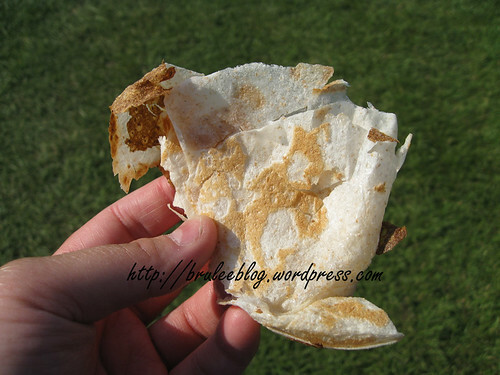 At the Arab tent I picked up a perfectly spiced kafta kabob served on a soft pita and topped with hummus. 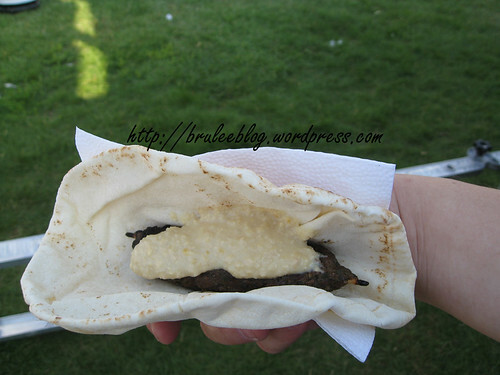 It reminded me of the kefta I had on my trip to Morocco. I also couldn’t resist some of the thin Arabic bread. If you haven’t seen it made before, I find that it’s interesting to watch as the baker rolls out a tiny ball of dough into a very thinly stretched giant piece of bread that is cooked on top of that round, pillow-shaped oven. The result is bread that is very thin, very crispy, and a teeny bit sweet. They would make a great substitute for chips, but I find they are only good when hot, as the bread becomes soft when stored in a bag and cooled. By the time I found the Malaysia pavilion, I was too full and I was starting to run out of tickets. 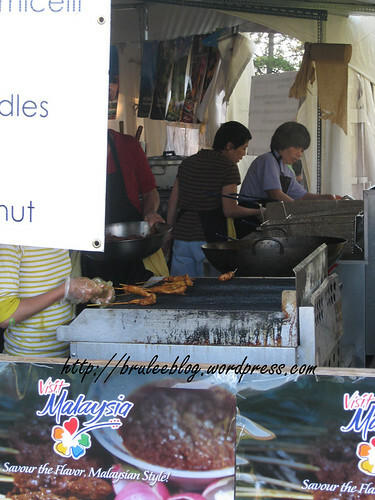 I was disappointed that I didn’t get to indulge in some Malaysian satay and fresh whole coconut. 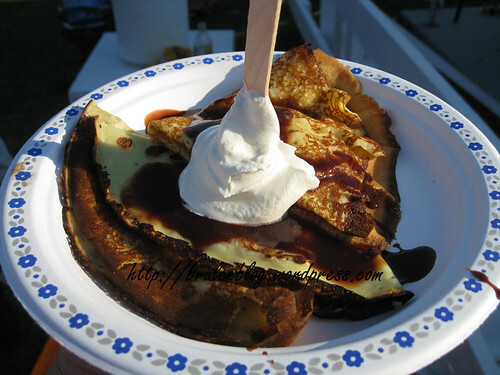 Instead, my last dish was dessert – Crepes Chocolat from France. It made the perfect ending for my long meal. Other items I had (but did not take photos of) were a tropical smoothie from the Polynesia pavilion and welsh cakes from Wales. 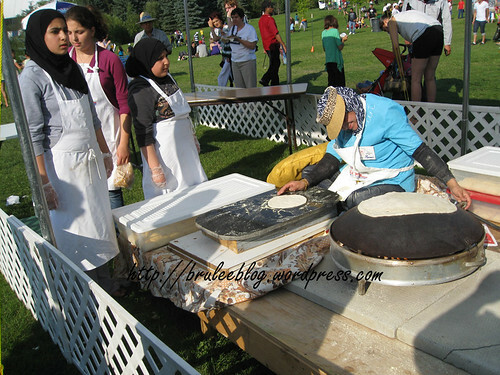 Some really get it at the heritage Festival, and understand the importance of having really good food – as that is the drawing card and what will make them double the money. Others just focus on the money and have so much difficulty getting volunteers that they are just thankful to get out whatever they get out. The tamales sounded so disappointing. I get so overwhelmed when I am there that sometimes I eat almost nothing, and just look. When there are so many choices, it is hard. Yet, as I am more travelled, I do look for favourites I cannot find easily otherwise, and that is so much fun. Thanks for the write up. You need to send the link to the Heritage Festival Office so they have it to show their people and they know you are doing htis!